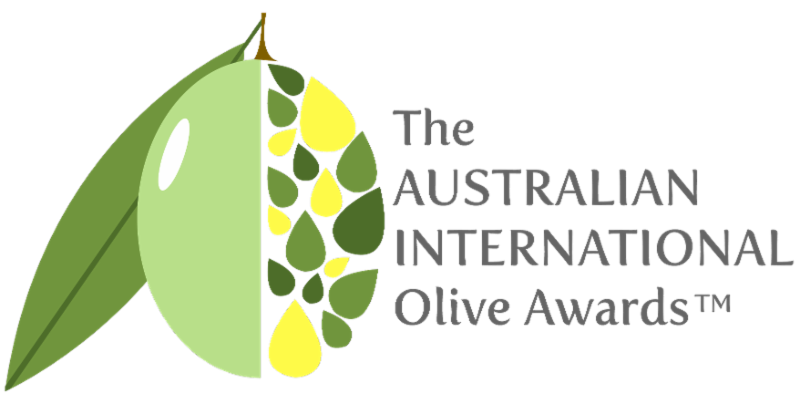 Entries are open for the 2018 Australian International Olive Awards, with the chance to be named Champion EVOO and/or Table Olive of Show. Now in its second year with international status, the competition provides the opportunity for producers to benchmark their products against both Australian and international peers – and to showcase their winning EVOO and table olives to the world. More information and enter here. Farmers across NSW are calling for urgent government action to protect the long-term sustainability of the agricultural industry after the state was declared 100% in drought this week. 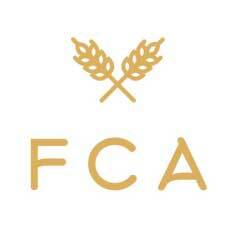 Sign the FCA petition calling for a long-term plan for farming and climate change here. Making a change: Wayne Adams from Erinvale Potatoes (left) and Robert Goddard from Coronea Olive Grove (right) with Gardening Australia host Costa Georgiadis. For Harvest Market stalls Erinvale Potatoes and Coronea Grove Olives, every month is Plastic Free July. 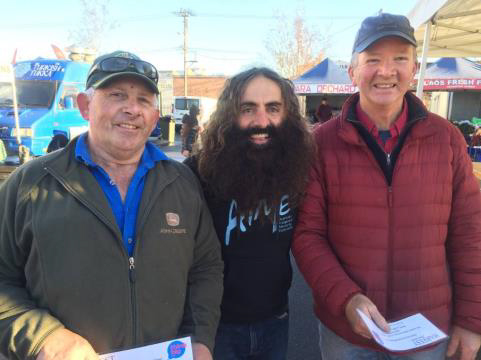 The stallholders from each site were recognised for their sustainable methods at Saturday’s Harvest Market, presented with $300 signage vouchers from Think Big Printing. Tapping into consumer trends AND making EVOO even more sustainable – great stuff! 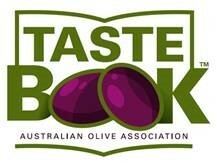 There’s one more week to register to participate in Round 4 of the Tastebook™ program, the AOA’s sensory training initiative in appreciating, describing and understanding how to improve the quality of EVOO and table olives. Tastebook™ Round 4 samples and basic instructions will be posted on registration, along with detailed instructions and training materials via email, for responses via Survey Monkey until 3 September. Register here for Tastebook™ Round 4 (closing date 20 August), access the SurveyMonkey Tastebook Round 4 response form here and learn more about Tastebook™ here. The (Qld) State Opposition Leader’s love for cooking has landed her second prize at the Ekka – and she is even happy to reveal her secret recipe. Why is this here? Read the ingredients list: good to see politician’s promoting our local product. This, friends, is nothing short of plate-based sorcery. As new book The Magic Of Food reveals, healthy eating is all about synergy - that is, eats that work way better together than apart. The first combo … “Turbo charge tomatoes with oil”. Registrations for the ONZ Conference 2018 and the NZ EVOO Awards Dinner are now open. Entries for the 2018 NZ EVOO Awards open next Monday, 13 August. Registrations for the Table Olives Course must be received by 31 August to confirm there are sufficient numbers. The closing date for Certification for those wanting to enter the NZ EVOO Awards is Friday, 17 August. 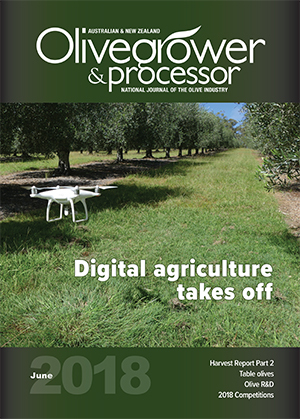 Olives NZ is currently compiling the 2018 Harvest Data Report and forms have been sent to all grower members. This is a valuable exercise, providing industry data to national and international agencies and also the opportunity for growers to benchmark against their previous grove performance. The information gathered also allows for regional and national comparisons to be made. All growers are urged to participate in this important exercise and can request a form via admin@olivesnz.org.nz. The J.M. Smucker Co. and Transnational Foods Inc. were slapped with proposed class actions in California federal court Thursday alleging that they dupe customers by labeling products as extra virgin olive oil when that's not actually the case. Wagyu beef – raised on a farm in Edenderry – and fed on a new natural livestock feed supplement developed by Irish feed producers, The Olive Feed Corporation, was on the menu at a recent tasting in Dublin. “… turning an environmental waste product into a nutritious food” – we’ve got to get on board the olive feed train! Castelvetrano olives have a meaty texture and a mellow, buttery flavor that’s not as assertive as the more ubiquitous kalamata or Spanish olives. I’d rather have them straight than breaded and deep fried, but you’ve gotta love someone who appreciates the varietal nuances of table olives. Israel is in the process of opening up its olive oil markets to the world, having raised its quota for duty-free olive oil imports. Licensed importers will immediately be able to bring 1,700 tons duty-free into the country, with this figure set to rise to 2,000 tons by 2020. Flying with Ryanair this summer? 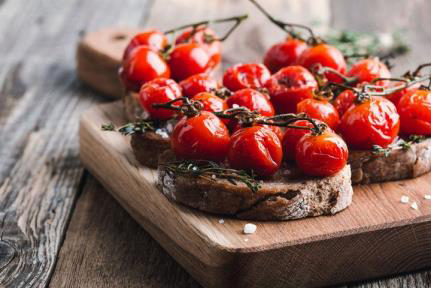 Forget the souvenir bottle of hand-pressed artisan olive oil. The airline doesn’t allow bottles bigger than a litre to be placed in hold luggage, a policy that has been in Ryanair’s smallprint since 2015, but we only discovered when our reporter’s stash was confiscated at Pescara airport.